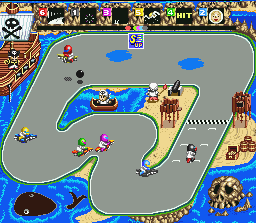 In the early-mid ’90s, few games matched the fun that Super Bomberman and Super Mario Kart provided. Ever wonder if someone was keen enough to sort of combine the two? A-Max did, at least, to some degree. 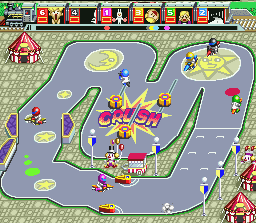 Battle Cross is a 6-player single screen racer. 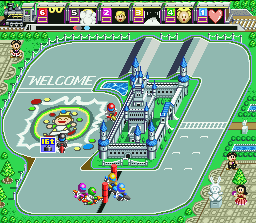 It does an admirable job of cramming bits and pieces of Bomberman and Mario Kart. The air-bike is easy to control. Once you get in the zone, you’ll be screaming past tight corners, blowing up the competition, and scorching toward the finish line with dazzling flamboyance unseen since the glory days of Babylon. Speaking of which, let’s take a look. Unlimited. You could be on one side of the track and still hit someone on the other. It’s weak though… only stunning the victim for a split second (but enough to tick the tar outta ‘em, which is half the fun really). Increases your speed for that entire race. Collect a couple and you’ll blaze right through the competition. Zipping at break-neck speed, anyone caught in your path will flip out. It’s just like the Star from Super Mario Kart. My favorite. The more land mine icons you collect the more you can lay at a time. If you collect three or four as I once did, you’ll OWN that race! Speed burst. If you’re on a track with steep hills, activate it at the bottom and watch your guy FLY! A one shot deal that, when released, darts around the track until it finds someone or burns out. Like the missile, a one time deal that sends a blue skeleton disc around the track until it finds someone or passes out. This causes the infected driver to go considerably slower. Evil in its purest form. Bolts a yellow skeleton disc around the track — if it finds a target, that driver will temporarily have his control REVERSED. On basic tracks the transition is usually no biggie. But on those with lots of turns, it’s a true you-know-what. Luckily, when infected, a fairy (!) appears carrying a first-aid kit. Touch her and instantly be healed. Love it. Odd and rather weird, but very cool! 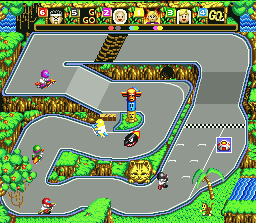 Three game modes: Battle, Grand Prix and Practice. 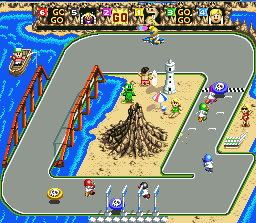 In Battle you pick from 1-30 laps to win a course. 15 is the default; I like playing on 10 just to keep things moving. Pick from 1-5 match wins. 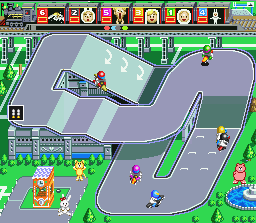 You can even select a new track after each round! 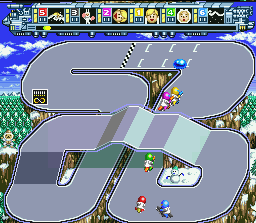 In Bomberman, you’re restricted to the SAME field until one player can win the designated amount. But here, say it’s 3 wins to the trophy; well, you can play on tracks 1, 2 and 8 if you wish. Brilliant! 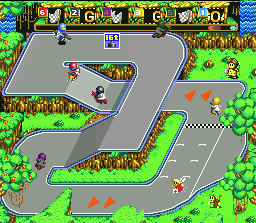 Up to 5 human players can play, with a total of 6 maximum bikers. 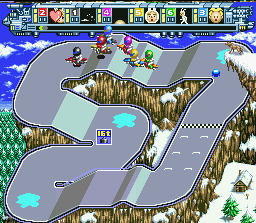 Any combo is possible: 1-on-1 race, or 4 bikers instead of 6. Go 7 laps, or 27. Adjust the AI from 1-5. It’s very user-friendly, just like Bomberman. 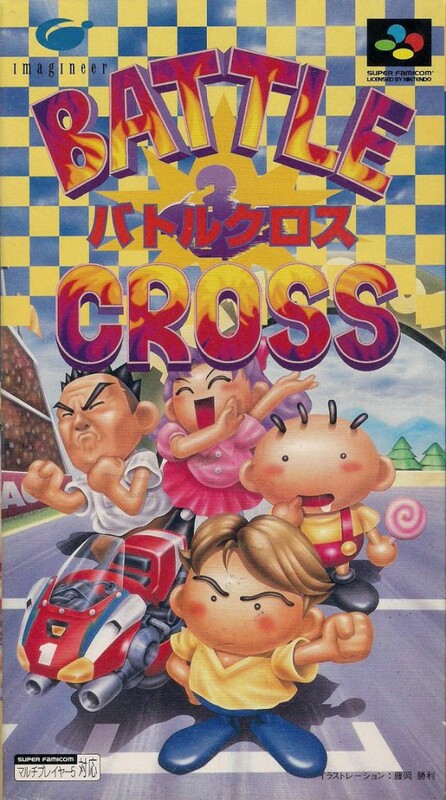 The Grand Prix follows a storyline, but like Bomberman the meat of Battle Cross is playing the Battle mode (and preferably with some buddies to truly enhance the experience). Nine initial courses are available, with one being unlockable. Let’s check ‘em out. A couple puddles atop and a grumpy pirate who doesn’t like trespassers highlight this track. He launches a cannonball across the screen every five seconds or so. If you find yourself in the line of fire, don’t be a chump, jump! The orange arrows operate as a speed burst. This is the first track to implement high and low drops. I really like the curve before the finish line — it’s the perfect opportunity to smoothly turn the corner and accelerate on through. And for some reason, I really dig the way the grass looks. It’s so lush. It’s the little things! This course rocks. Leap over the wooden spikes and watch out for the rocket that comes screaming out of the hole. A little gate near the totem pole swings open periodically, allowing the precious possibility of a short cut. But if the gate closes as you go for it, the AGONY! The shrubbery at the bottom left obstructs the playing view. It’s ripe for mine-dropping. Overall this course has a good deal of strategy, making it one of my favorite courses in the game. See that wolf peering over the cliff there? Nice! It’s the little things that make video games cool I always say. Here the slopes get very steep and if you got Nitro, use it at that bottom hill. Your momentum can propel you straight through the finish line! It’s similar to using a mushroom right before the jump bit on the very first iconic Ghost Valley track from Super Mario Kart. Twice the hidden overpasses equals twice the potential danger of land mines. I love the corner where my red guy is at — making a smooth turn and having that long raceway to steam forward is pretty cool stuff. Love this devious track. It’s wide open… til you get to the two red pillars. To make matters worse, they move randomly! It’s a short stage but very fun because of the chaos the red pillars can cause. Blue and yellow there did OK — green and purple not so much! As for me, red, oh you know.. you know… uh… overlapping them. *cough* Nothing beats cutting through those pillars unscathed. Not only will you probably be in the lead but you’ll look real cool too, oh yeah. Pinball-mania. Madness I tells ya. The 3 yellow bumpers move and are hard to avoid. Hit the bumpers as I did here, and you’ll be bouncing back and forth for a few. He who minimizes mistakes, will win. -You won’t need to understand Japanese to enjoy this game, though the storyline in Grand Prix will fly over your head… but no biggie, ya know?